QWED has continued efforts on extending availability and functionality of the QW-Modeller for QuickWave software for electromagnetic design as well as the scope of its applications. 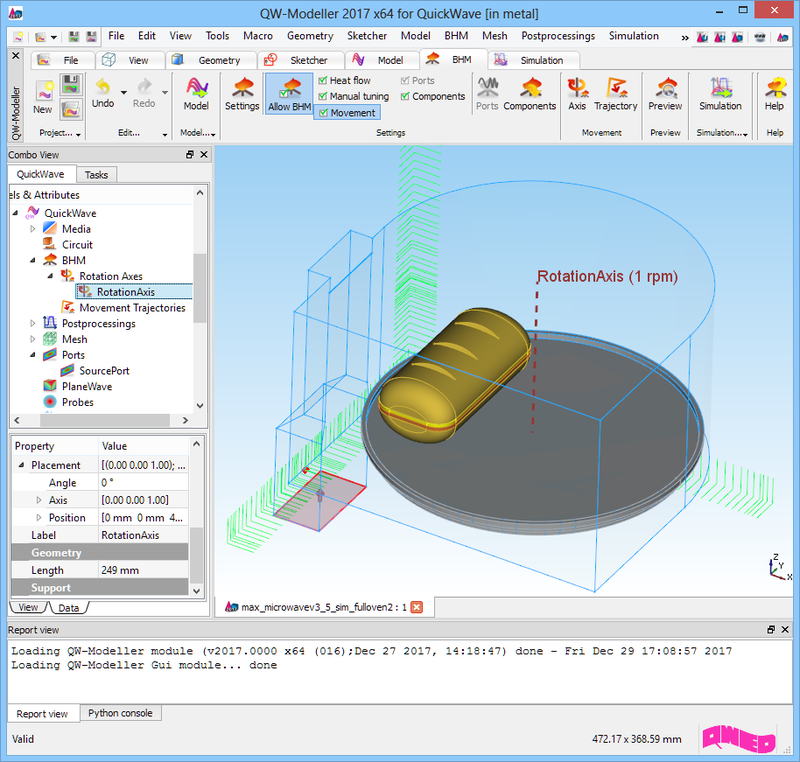 The most visible change in QW-Modeller 2017 is the reorganised Ribbon, which groups all necessary commands that guide the user during project preparation: defining basic project settings, drawing 3D and planar geometries, setting excitation type and its parameters, boundary conditions, meshing, configuring microwave heating simulation (with Basic Heating Module), setting postprocessings, and starting simulation process. The new QW-Modeller Help system provides easier and faster access to the specific topics. The QW-Modeller Help system is divided into subcategories and is available from the Ribbon and most of dialogues of QW-Modeller. The Basic Heating Module is now enhanced with a wide variety of options, allowing defining complete BHM process directly from QW-Modeller interface, which include intuitive configuration of Rotation Axes, Movement Trajectories, declaring variable heating steps etc. The effective and practically useful solution for simulation convergence monitoring has been recently enabled in QuickWave. It utilises monitoring of the electromagnetic (EM) energy in the calculation model and stopping the simulation when it decays to a certain level. This allows reducing the number of performed FDTD iterations and as a result the computing time, without reducing a computational accuracy. This solution is now available for configuring in QW-Modeller as Energy Stop Criterion feature. QuickWave allows for analysing infinitely thin metal layers (metal layers of zero thickness). This allows avoiding small cells, and thus prolonging the simulation time, resulting from very small thickness of metal conductors in planar structures. The thin metal layers are enabled in XY plane and now can be created in QW-Modeller from face and cross-section. To facilitate using QW-Modeller and QuickWave in microwave courses, the examples investigating basic electromagnetic scenarios has been included, as well as a short background description. These examples, together with microwave background description, become complementary introductory to fundamental microwave phenomena.